A recent family portrait session took me to Snettisham in North West Norfolk. Snettisham is a lovely location nestled beside the coast and in very close proximity to the Royal Sandringham Estate. The family I visited as a Snettisham Photographer were on holiday at the beautiful Sutton Lea Manor. The manor is a large house located in lovely gardens on the edge of the village with a great vantage to look upon the village itself. The gardens made for a great spot in which this extended family’s children could play in safety and in which I could photograph the family. Keen to use their holiday time to head to Snettisham beach for a while before heading home we made an early Sunday morning start to the session. Children are often up and about bright and early and on this occasion there were no exceptions. 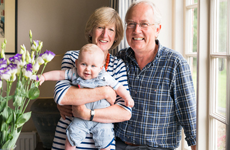 I photographed the whole family together in several locations with their grandmother before we used various locations in the manor’s lovely gardens to photograph the members of the family including the grand children, mums and dads. We got to use doorways, red wood sequoia trees, cool areas in the shade of beach trees, and the lawns to create lots of variety in the images produced. The great thing about the early start and the gardens at Sutton Lea Manor was that on an otherwise particularly sunny day we found lots of shaded spots for photography. 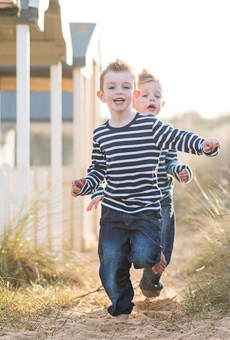 We also had the session wrapped up within two hours despite having a large family to photograph and this meant that the families could head to the beach before long car journeys home at the end of the day ready for school on the Monday morning. If you would like to book a portrait session then please feel free to get in touch. 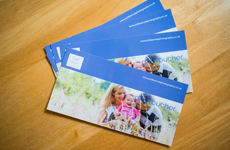 I’m glad to say that a presentation boxed USB has been delivered to this family containing all the edited images from their session ready for printing and a HD slideshow which allows them to view all the edited images in a leisurely fashion. I hope you like a small selection of the photographs produced. Anyhow, we met up in the carpark to the common and quickly discussed the couple’s usual walk around the common with the dogs. It’s quite often nice as a portrait photographer to know the locations in which you photograph people but on this occasion I was flying blind so quizzed my guides a little as to the terrain and topography of the common prior to our walk. This is essential from the photographers point of view so as not to miss photographic opportunities that only present themselves in certain environs. An example of this would be the photographs below that show the couple sitting on a bank with their dogs. The bank in question was the back edge of a golfing green which happened to have a lovely set of oak trees behind it which created a nice place to sit in the open with a solid background of colour. There weren’t that many similar locations throughout our walk so it was great to spend a bit more time at this location to allow the dogs to relax and the owners to general be fussed over. We met open tracks, gorse bush mazes, pillboxes, woodland, banks, horses, open golf course and even the golf courses HQ on our walk, utilised each opportunity for a photograph and carried on. It was great to get to know this lovely couple more and to see the wonderful relationship they have with their family of dalmatians. I was invited to photograph a family get together the cause of which was the significant birthday of the family’s oldest member. Even better was the fact that the gentleman concerned owned a beach hut at Old Hunstanton: what could be better than a family session with a lovely beach hut as the base for a session? Sadly, events arise over which we don’t have control and not long before his 90th birthday a knee operation meant that the eldest member of the family couldn’t really head to the beach. As a substitute we utilised a communal park in Hunstanton for the photographs. The park was close to one of the family homes, easily accessed via wheelchair and a lovely spot for some family photographs, perfect to make sure that everyone could be pictured in the photographs. Great Grandad managed with his stick for some photographs kindly helped out by his family members and on other photographs in the absence of seats in the park with nice backdrops we used a chair from the family house beside the park so that he could sit comfortably. There was plenty of time for the families to have some individual photographs, in addition to full family photographs, for partners and children, grandparents and couples. It was great fun, with the springtime leaves bursting out on the trees and a bit of brightness in the sky from a friendly sun. A Hunstanton photographer obviously has access to the beach, to the walk along the cliff tops to the lighthouse and of course a short stones throw away is the great beach, beach huts and cliffs of Old Hunstanton. If you want to get the family together for a shoot then get in touch. I hope you like a few of the images from this session. I’m often convinced that I may become a naturalised Wells Next the Sea photographer. Wells is a great holiday destination, a great place to visit and always proves very popular particularly for its unique beach environment. The beach at Wells is a huge beach, not generally one where the sea is inviting, but when you have beautiful yellow sands, beach huts, and a gorgeous woodland behind the beach who necessarily needs a dip in the sea? Add to this a miniature railway connecting beach to town, and a beach cafe and toilet facilities and well it’s a great place for families, for couples and just to generally have lots of fun. No wonder I spend a great deal of time visiting Wells to photograph people. On this occasion, there was a grandmother, with a significant birthday to celebrate and a lovely family who thought they’d surprise her in a way she’d appreciate-with photographs of her family of course! It was the day of the birthday party when I met the family at the beach, and I was asked to photograph the two families of the grandmothers’ sons, 4 parents, 4 children, no problem. Full of adventure the kids led the way in exploring the woods, three boys and one extraordinary girl whose tree climbing ability only led me to believe that she was part squirrel 😉 With mums and dads in tow the kids found fallen logs to sit on, little dens to hide in, a swing to swing from with the parents leading the way in this pursuit, trees to climb in abundance, suspended logs to shimmy along, logs to pick up, sunny glades to run through with mum and dad. I’m often asked how you keep children amused during a photo shoot and I’ve got to say the secret is in letting them be themselves, exploration, adventure and fun is the key to a child’s heart and as well as indulging the children it’s often great to see parents letting lose and enjoying themselves too during natural lifestyle sessions. We finished in the woods and headed onto the beach with the vastness of the foreshore being even more impressive after spending some time in the woods. On the beach there were piggy backs, racing, jumping around in the sand, in addition to frisbee, and generally being spun around by dad’s. It was great fun, and that evening a very special grandmother got a preview of the photographs produced at her party. 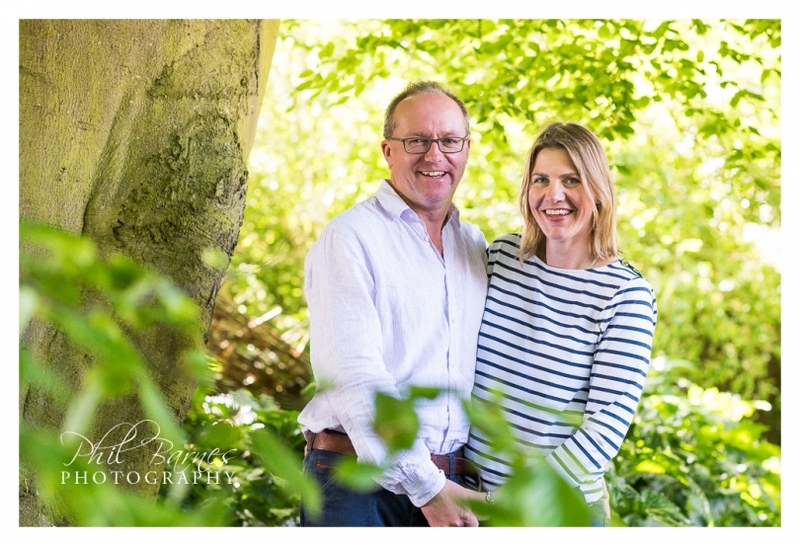 I hope you like some of the photographs from the session, and if you would like a natural lifestyle portrait session feel free to get in touch? 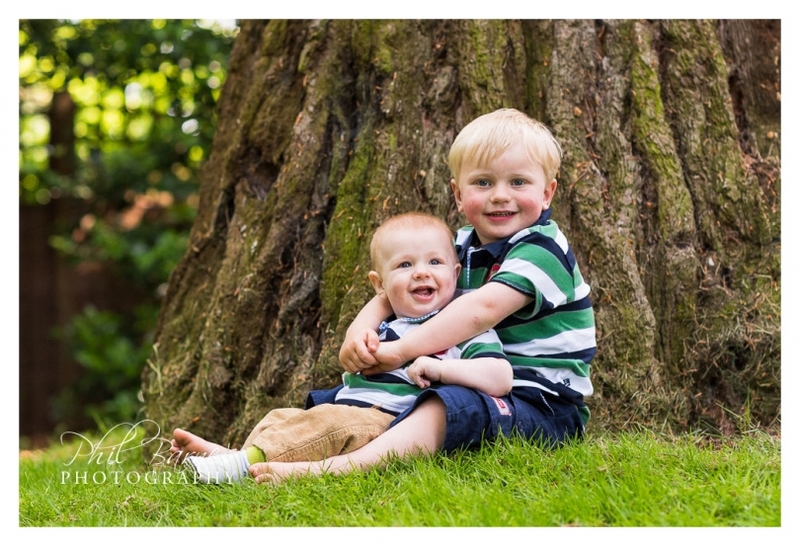 I had a lovely visit to a family home recently for a springtime family portrait photography session. The session involved three generations of the same family and started with some studio style images inside the family home and quickly moved onto some outdoor portraits. 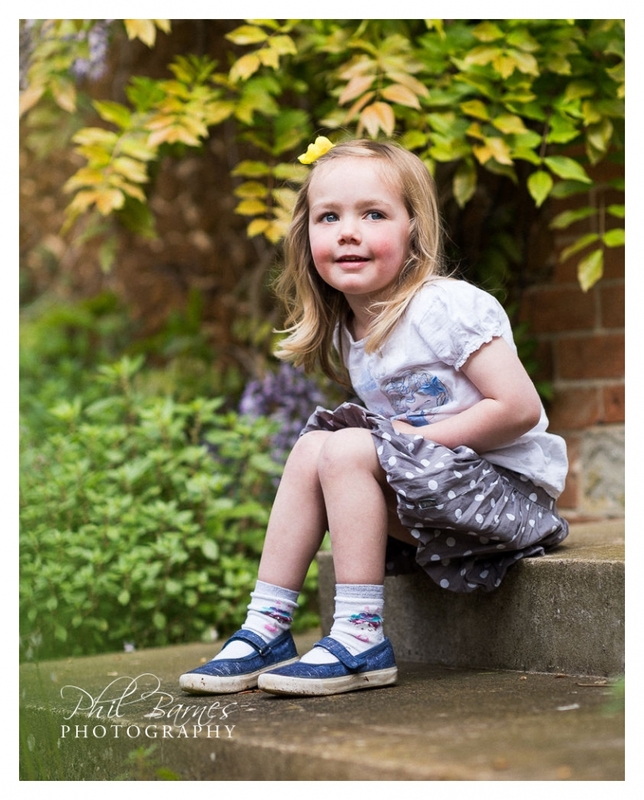 I used a portable studio background and studio lights to produce some images on a plain studio background for the family first, but with the sun shining the younger members of the family were keen to venture outdoors for some photographs. It was a lovely spring day with bright sunshine. Although a little early to benefit from any shade from trees in full leaf which would’ve been welcomed, a great showing of daffodils meant that I quickly asked permission to use a bank of daffodils for some photographs of the family’s young ladies who obliged. An extra bonus was that the daffodils allowed me to photograph the girls with the sun to their backs or backlit as photographers would say, which was perfect as I didn’t need to worry about how bright the sun was shining in people’s eyes on this occasion. We then utilised other areas of the garden and the outside aspects of the family home to take some more photographs often producing legacy images following on from previous family portrait locations cherished by the family concerned. It’s lovely to be able to take this type of photograph for a family as it charts the passage of time and the development of a family and gives the family photographs of a likeness separated by more than a little time on occasion. With a lovely large garden it was almost a slight shame that the sun was quite so strong, as it did mean that at this early point in the year that I had to work against it’s brightness but we were more than happy to be able to benefit from it’s warmth and great colour. We had a great time, let little people explore and have some fun and produced some photographs that will hopefully be cherished for many years to come. A lovely family to meet and photograph, I hope you like a small sample of some of the photographs produced.